New Location between 60th and 63rd on Imperial Avenue! 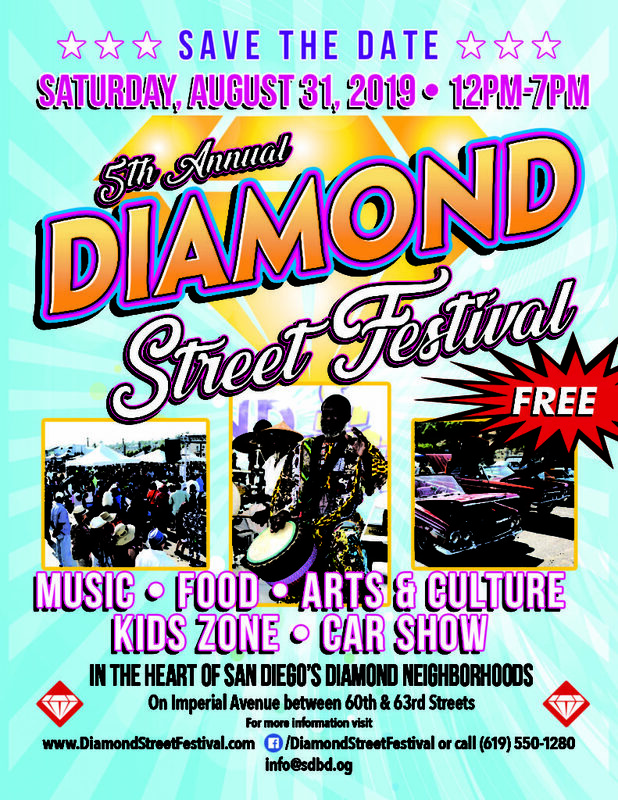 Our Fifth Annual Diamond Street Festival will once again be a day of community celebration that takes place in the heart of San Diego’s Diamond Neighborhoods on Saturday, August 31, 2019. This unique street festival celebrates the rich history, diverse cultures, and captivating energy of the people of Southeastern San Diego. Entrance to the festival is FREE. Listen and groove to local and regional live music and cultural performances showced on the entertainment stage. Taste the diverse flavors of culturally traditional foods and drinks. Shop for amazing and beautiful arts and crafts sold by local artists and vendors. Get educated and activated in our specialty pavilions! Are you or someone you know looking for Community Service Hours? Do you want to be part of this unique street festival that celebrates the rich history, diverse cultures, and captivating energy of the people of Southeastern San Diego? Contact info@sdbd.org for volunteer opportunities. The Diamond Street Festival is the perfect place for you to market your small business to the community and/or sell your products to local consumers. With 4,000 people expected to attend this year, this is an opportunity you will not want to miss! Send your application and payment in now because booth spaces are filling up fast.